Library Ninja: "We didn't get sucked into a black hole last night"
"We didn't get sucked into a black hole last night"
It's true. We didn't get sucked into a black hole while we slept. Hurrah! And why might we have? 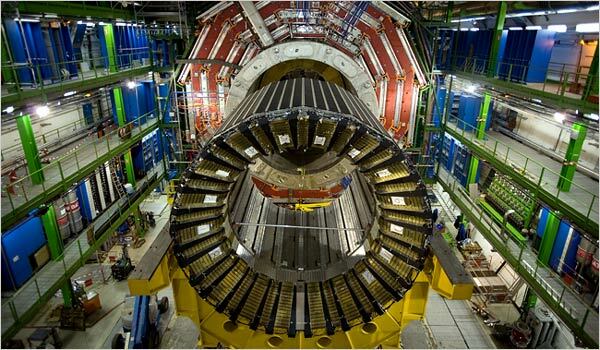 Because scientists just outside of Geneva, Switzerland tested the Large Hadron Collider (LHC) last night. I have to admit that I was a little wary about it, but since I didn't wake up in an alternate universe or have my molecules collided to smithereens, I'm actually really excited about it. Scientists basically took some particles (protons and ions), spun them around at the speed of light, each going different directions, and then let the particles collide. Scientists call these collisions "Mini Big Bangs." If you click on this link to NPR's "Morning Edition" (yeah, yeah, it's the type of thing your Mom listens to on the way to work in the morning), you can hear a 4 minute story that includes the countdown to running the collider and the reaction of the scientists. What's amazing is how short a time there is between the countdown and the scientists reactions. Of course, we are talking about particles going as fast as the speed of light (299,792,458 meters per second!). The reason the LHC is so cool (besides the fact that it sits 300 feet below ground and is 87,463 feet in circumference) is that scientists hope it will reveal some mysteries of the universe, like: How was the universe formed? Are there particles even smaller than quarks (quarks are inside atoms)?